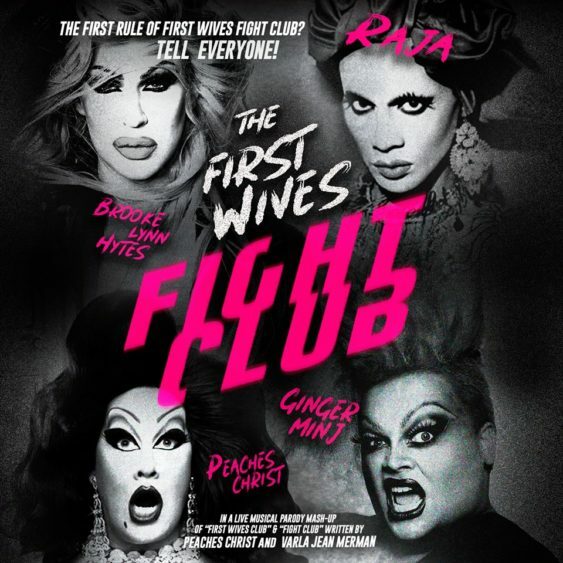 SF drag legend Peaches Christ & Varla Jean Merman invite you to experience their live, musical parody mash-up of the now-cult-classic films, “First Wives Club” & “Fight Club“(celebrating its 20th anniversary). This is a wild ride of insane and offensive comedy. Starring the gorgeous and indelible talents of RuPaul’s Drag Race superstars Brook Lynn Hytes, Ginger Minj and more. San Francisco 4/7, Portland 4/16, Seattle 4/18, and Los Angeles 4/20…followed by a Canadian tour. Sorry! The contest for "First Wives Fight Club" Epic Drag Spectacular | Castro Theatre has ended.